Following a major suicide bombing in the border town of Suruc (in Turkey) a couple weeks ago, Turkey has officially joined the war against ISIS—though it is not clear exactly what Turkeys’ motives are by attacking ISIS… will Turkey use the excuse of fighting against ISIS as a tool to also bomb Kurdish positions close to ISIS positions? Remember, the Kurds and Turks have a hostile relationship that goes back years. For months Turkey avoided direct participation in the fight against the Islamic State, limiting its role largely to supporting certain Syrian rebel factions. The reality behind this strategy was in fact an unofficial truce with the Islamic State under which Turkey turned a blind eye to Islamic State activities in Turkey– as long as the militants did not attack Turks within its borders. What this means is that Turkey allowed the Islamic State to sell oil and move personnel across the Turkish border back and forth into Syria. But now Turkey is turning its attention against ISIS, perhaps because it wants to influence America as it believes Iran and the western powers may come to an agreement on how to divide up Syria. They want to prove to America (whom they now wish to accommodate), that they are anti-ISIS. This change in positioning would help them to secure a “piece” of Syria should it be partitioned. Turkey is also seeking to contain Kurdish ambitions for autonomy, and to ensure its dominance over Syrian armed opposition groups. It gets complicated, I know; the Middle East is layered with an almost endless assortment of factions, tribal strife, wars, power struggles and strange alliances (Egypt, Saudi Arabia, and Israel have an unspoken agreement to thwart Shiite Iranian ambitions in the Middle East). These nations will work together to hurt Iran. Turkey is one of the most geographically strategic countries in the world—a potentially lethal bridge between continents. İstanbul is the only city in the world that connects two continents. The city, which is located in both Asia and Europe, has been the capital city for many civilizations for thousands of years throughout its history. Turkey has been called the World’s Island, a central meeting point of three continents – Asia, Europe and Africa via the Mediterranean and over centuries was used as the passage way for invaders both going from West to East and from East to West. To its south you find Syria, Iraq and Iran; on its east lays Armenia, Georgia and Azerbaijan—former Russian satellite nations. 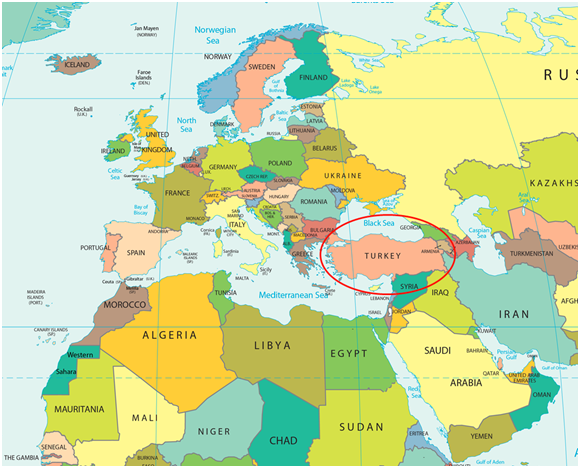 To the West Turkey borders Greece and Bulgaria—European Union nations. It connects to the Mediterranean, Black and Aegean seas, and overlooks the all-important Bosporus and Dardanelles sea gates, linking Central Asia to the Mediterranean. In a world swayed by energy needs, its nexus location translates into a crucial energy transit hub for Europe, Iran and Russia. Turkey is a Sunni nation of 78 million and boasts the 2nd most powerful army in the Middle East with 410,500 active frontline personnel, 3657 tanks and 989 aircraft. Turkey views the Middle East as its sphere of influence and will not brook any country, whether Iran or Saudi Arabia, encroaching on its ambitions. Turkey, like Iran, is seeking to dominate the region. It is hostile toward the Kurds and does not trust the Iranians, who are Shiite. Turkey’s relationship with Iran is not hostile, but it is guarded. Turkey is somewhat dependent on Iran for its energy needs. Importing 26 percent of its oil from Iran in 2014 and is one of the biggest markets for Iranian natural gas. As far as the United States is concerned, it does not want any one power to become too dominant. So America lukewarmly supports Turkey, Saudi Arabia, Israel, Egypt, and is attempting to diminish tensions with Iran, all in the hopes of creating a balance of power in the Middle East where one nation cannot exercise too much power thus extending its influence over others. “They have taken crafty counsel against Your people, and consulted together against Your sheltered ones. They have said, ‘Come, and let us cut them off from being a nation, that the name of Israel may be remembered no more.’ For they have consulted together with one consent; they form a confederacy against You: The tents of Edom and the Ishmaelites; Moab and the Hagrites; Gebal, Ammon, and Amalek; Philistia with the inhabitants of Tyre; Assyria also has joined with them; they have helped the children of Lot” (verses 3-8). These biblical names are significant. Edom includes the Palestinians and some of the Turks. The Ishmaelites, descendants of Ishmael, are many of the Arab peoples which would include Saudi Arabia and various tribal groups throughout the Middle East and North Africa. Moab is the area of central Jordan. The Hagrites appears to be other descendants of Hagar, mother of Ishmael. Gebal, meaning “mountain” or “boundary,” may be a reference to the Phoenician city of Byblos, modern Jubayl in Lebanon. Ammon refers to northern Jordan around Amman, the capital (which gets its name from Ammon). Amalek appears to refer to a branch of Edomite Palestinians found in Israel, Jordan, Iraq and Turkey. Philistia is the area around what is known as the Gaza Strip. The children of Lot refers to Moab and Ammon—regions of modern-day Jordan. Turkey is stirring; it will be interesting to see if in the future it takes on a more prominent position in Middle East politics asserting itself in regional power plays.